Crossing the Road Like a Boss! 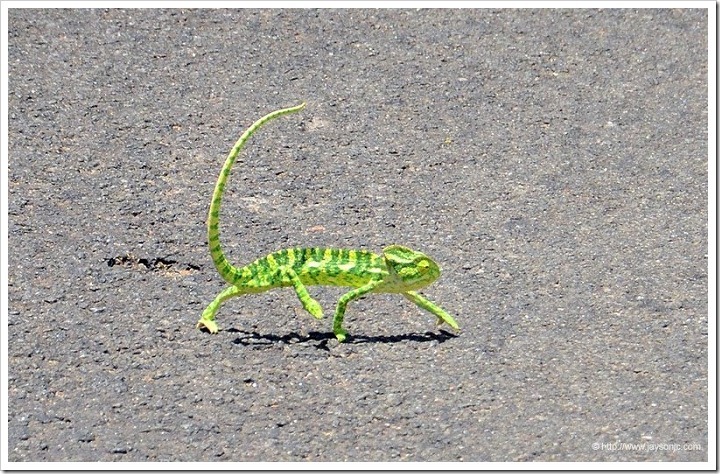 We spotted this green chameleon crossing the road in Palani forests while driving from Kodaikanal to Periyakulam. My brother was driving and I was sitting behind. Suddenly this guy appeared from the left of the road about 100 meters ahead of us. We stopped the car and I started taking photos. The most memorable part of this encounter was his walk! He was "walking like a boss" while vehicles were speeding on both sides. I walked beside him until he reached on the other side safely and he was eyeing me all the time! He was back to his happy mood once he climbed on to a large bush on the roadside. Kodai ghat road which goes to Periyakulam and Dindigul passes through the Palani forests and the hills. Most of the road is actually through the forests and wildlife sighting is quite possible. While we were driving to Kodaikanal, a leopard crossed the road right in front of our eyes! Along the Palani Hills road, there is a watch tower (now in abandoned condition) from where you get breathtaking views of the valley below including the Manjalar dam catchment area.